The Coalition’s Trachenberg Plan stated that its armies should avoid battle with the main French body, commanded by Napoleon, but should seek battle with isolated enemy corps. By August 21 Blücher realised that he was advancing on Napoleon, so withdrew. Napoleon had created the Army of the Bober, commanded by Marshal Jacques MacDonald to guard his left flank. MacDonald’s orders were to push Blücher back to Jauer, and then pin his army in Silesia. On 26 August MacDonald, believing that Blücher was still retreating, crossed the River Katzbach in pursuit. Blücher, however, realising that he was not facing the main French army, had decided to take the offensive in accordance with both his natural desire to attack and the stipulations of the Trachenberg Plan. The two armies both thought that the other was on the defensive, so both were surprised when they encountered each other advancing. MacDonald’s army, consisting of III, V and XI Corps and II Cavalry Corps, was widely spread, and poor roads slowed down its advance. MacDonald detached 12,000 men from V and XI Corps to cover his right flank, which was not threatened, and ordered his largest force, III Corps, to cross the Katzbach at Liegnitz and attack the enemy’s right flank at Jauer. The rest of his army was supposed to pin the Coalition forces in place. General Joseph Souham, who had taken over III Corps from Marshal Michel Ney because Napoleon did not want to have two Marshals with the same army, claimed that the Liegnitz crossing was impassable because of heavy rain, although General Fabian von Osten-Sacken’s Russian corps managed to cross there two days later. Souham decided to move back towards the rest of MacDonald’s army, but found itself in a traffic jam. Only one of its four divisions managed to cross the river in time to play a role in the battle, and it had to leave its artillery behind. Once the French had crossed the Katzbach they had to climb about 75m up a steep and heavily wooded slope to a featureless plateau. Dominic Lieven notes that they had to use a path that is still difficult by car in muddy or icy conditions. On the plateau the French encountered the 55,000 Coalition troops of Count Johann Ludwig Yorck’s Prussian Corps and Sacken’s Russians, who were also advancing. Only about 27,000 out of 67,000 French troops available made it to the plateau by 2pm, when the fighting began. The rain meant that muskets could not be fired and had to be used as clubs, so the fighting was mainly hand to hand. The French were forced to retreat, with many being drowned as they tried to cross the Katzbach, which had risen because of the rain. Further south French troops under General Jacques-Alexander-Bernard Lauriston attacked Coalition forces under Count Alexandre de Langeron, a French emigré in Russian service. Langeron had fewer infantry but more cavalry, and was in a strong defensive position. However, he initially gave ground, until he was sent reinforcements at 4pm. He then counter-attacked and recaptured most of the ground lost. F. Lorraine Petre says that the Coalition captured at least 12-14,000 prisoners and 36 guns. Their own casualties were not recorded, but were heavy. Wikipedia gives casualties of 15,000 French and 4,000 Coalition troops. 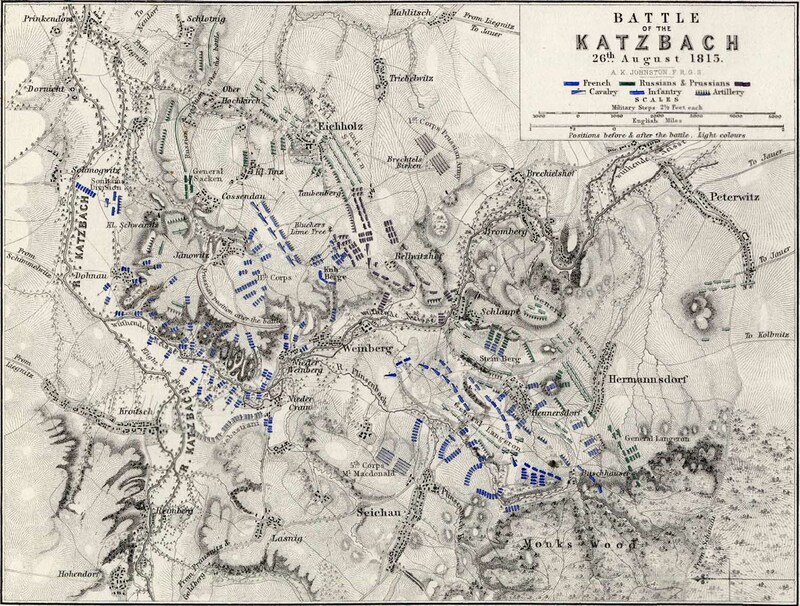 Lieven notes that the French defeat at the Katzbach was turned into ‘catastrophe’ by the pursuit. It lasted until the first week in September, by when MacDonald’s army was back in Saxony and had lost 35,000 men. Langeron, who had been dilatory in the battle, performed well in the pursuit. Blücher gave great credit to Sacken for the victory at the Katzbach. He was promoted by the Tsar and cheered by Yorck’s Prussian troops. Troops strengths are from F. L. Petre, Napoleon’s Last Campaign in Germany, 1813 (London: Arms and Armour Press, 1974, first published 1912), pp. 252-53. D. C. B. Lieven, Russia against Napoleon: The Battle for Europe, 1807 to 1814 (London: Penguin, 2010), p. 379. Quoted in Ibid., p. 381. Petre, Napoleon’s Last Campaign, p. 256.